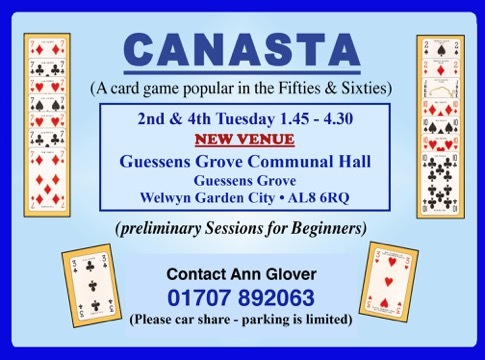 Canasta is a card game that was popular in the fifties and sixties. This group meets on the 2nd & 4th Tuesday of each month, from 1.45 to 4.30 pm, at Guessens Grove Communal Hall, Guessens Grove, Welwyn Garden City, AL8 6RQ. All games are friendly, with preliminary sessions for beginners. Due to the number of people in this group I am unable to accept any more new members. I have a waiting list, so if anyone is interested I will gladly add your name. Web-site created by Roger Swaine.